This is the review I did for Goodreads. When a family friend dies mysteriously, Mercy has no choice but take on the task of helping Dixie his grieving widow arrange the funeral and also snoop around to find out why Gavin died. Mercy a nurse, and daughter of a PI who sometimes helps in her father’s cases, doesn’t want to get involved, but her parents are on a cruise. Besides Gavin was like family and she feels she owes it to both him and Dixie. She takes on the job but as she begins her investigation she uncovers another mystery – a dead bride in the Church. 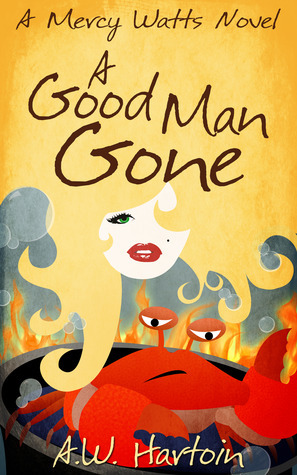 Good Man Gone is fast paced. The characters are fun and interesting. There’s Aunt Miriam, a nun who takes charge of the funeral arrangements, Chuck her cop cousin who has a thing for her and thinks she shouldn’t be meddling in police work, Uncle Morty the PI who helps both her dad and Gavin with their cases, Millicent and Myrtle – the Bled sisters and Aunt Tennessee, Mercy’s mother’s sister who’s the complete opposite of Carolina. Then there’s Aaron the restaurant owner, who is always cooking up new and strange recipes. He comes across as a likable character that cares about others, as can be seen in his protective nature towards Mercy. But I was surprised that the author portrayed him as she did. He is always either dressed in dirty food stained clothes or smelling, or both. This is a little out of place since personal hygiene is something I would have expected to be of utmost importance to a restaurateur trying to attract customers. This somehow seemed out of place in the story. Despite having two deaths and a few murderers on the loose, this is an enjoyable story that will keep you guessing right to the end. There’s not one moment of boredom as Mercy, the Marilyn lookalike, tries to work the case and stay out of the way of the cops. As she retraces Gavins footsteps before his fatal death she comes across information that is quite startling and leads her along a path of mystery. Will she solve the mystery of Gavin and Rebecca or will she become a victim? Equal doses of humor and suspense make this a very entertaining book. I couldn’t put it down and would definitely read the rest in the series. I got this free book from Bookbot.